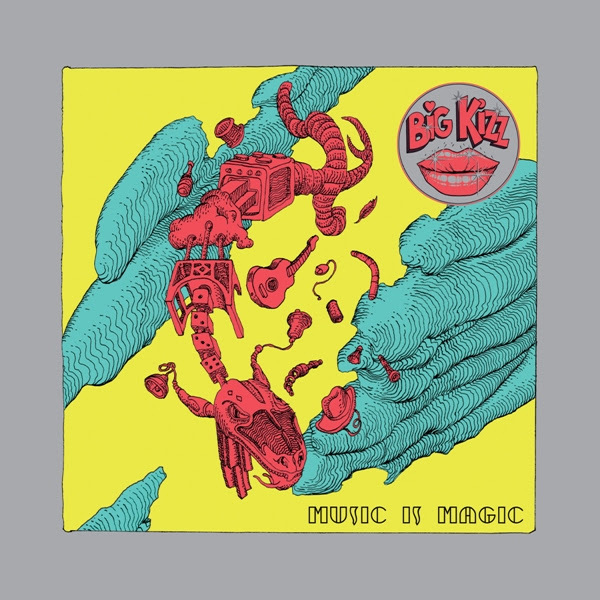 BIG KIZZ — the rock band featuring drummer Axel Sjöberg (ex-GRAVEYARD), guitarist John Hoyles (SPIDERS, ex-WITCHCRAFT) on bass and vocalist/guitarist Pontus Westerman from Swedish garage outfit LADY BANANA — will release its debut album, “Music Is Magic”, on May 18 via Tee Pee Records. The first video from the disc, “I Want My Girl”, can be seen below. BIG KIZZ plays good-time rock ‘n’ roll energized with elements of power pop, garage rock and punk that will have toes tappin’, ears ringin’ and mouths singin’ from the moment the needle hits the wax! BIG KIZZ burst onto the scene in 2017 with its debut, “Eye On You”, an EP filled with upbeat rock ‘n’ roll circa 1976, when proto-glam and punk rock were hardly distinguishable from each other. Combining a love for British guitar pop songcraft with crunching power chords and a tongue-in-cheek flair for the absurd, the band’s impending long-player, “Music Is Magic”, is an explosive fusion of BEATLES-esque melodic hooks, WHO-styled power, and a twisted sense of humor. Lyrical content deals with universal themes such as unrequited love and — of course — stickin’ it to the man; something we can all get behind. The record also includes a blistering cover of the BIKINI KILL classic “Rebel Girl”.